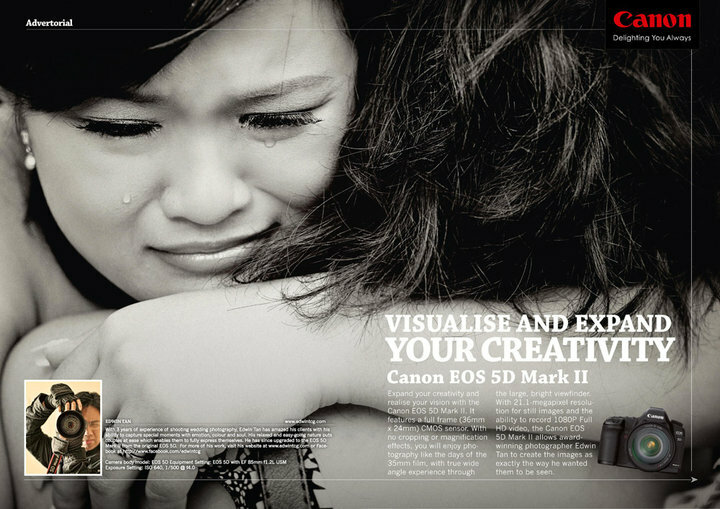 Thanks again to Canon Camera Malaysia for featuring my work in the latest DSLR Photography Magazine Malaysia (August issue). The below are also posted in Canon Camera Malaysia Fan page in Facebook. I have been searching for the magazine since this afternoon at few bookshop outlets. Seems it is not distributed yet. Will get a copy and post again. When Canon Camera Malaysia ask me for an image selection, I selected this photo. Yes, the one who won me a 2nd place in Emotion Category in 3Qtr 2008 AGWPJA. After 2 years, this photo is still one of my favourate shoots among 22 awards winning images that I obtain for the past 2 years. Thanks Adeline, the bride too for this marvelous image. WinnieKepala - Amazing. This is a great shot! Congratulations! Alan Leong - CooL! congrat!